NEW YORK, NY--(Marketwire - September 24, 2010) - Fall in love all over again, from a private suite terrace overlooking the Manhattan skyline, when you book the "Terrace for Two in New York City" package at the Renaissance New York Hotel 57; a perfect choice among New York boutique hotels, for couples to reconnect. Couples who take advantage of this romantic two-night package receive deluxe guest room accommodations at this intimate 57th Street hotel, a bottle of chilled champagne upon arrival, assistance from the hotel's personal navigator concierge service to help plan a night on the town; and room service brunch for two served on their private outdoor terrace. 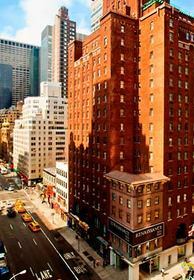 Rates for this East Side New York hotel package start at $449* and are valid through Oct. 31, 2010. Guests who reserve this special promotional package will enjoy the hotel's unique and artful décor and guest room accommodations. Guest rooms feature luxurious Renaissance Revive cotton bedding ensembles. In the room's marble bathrooms, guests will find soothing Aveda bath products and personal guest robes. Rooms also feature flat screen televisions, high-speed wireless internet access and coffee makers. "Terrace for Two" rooms may be booked online at http://www.marriott.com/hotels/travel/nycbr-renaissance-new-york-hotel-57/ by using promotional code ROM or call 1-800-228-9290 for reservations or information. This luxury Midtown Manhattan hotel is also home to the acclaimed Opia restaurant, open daily for breakfast, lunch and dinner, where guests can enjoy contemporary casual French food in a secluded and comfortable atmosphere. *Rates are per room, per night and valid for a two-night weekend stay of Friday/Saturday or Saturday/Sunday. Offer is based on availability at the time of reservation and must be booked 72 hours in advance. Promotion does not apply to groups of 10 or more rooms and may not be combined with any other discount or offer. Please visit hotel website for additional terms and conditions. The Renaissance New York Hotel 57 features contemporary couture interiors by award-winning designer Jordan Mozer while maintaining its classic and distinguished presence on New York City's 57th Street amid prestigious galleries and fashionable shops. Conveniently located near Central Park, Carnegie Hall and some of New York's finest dining and museums, the Renaissance is a perfect destination for New York City travel. Enjoy the location of this classic boutique hotel on the East Side. Renaissance New York Hotel 57 is within walking distance of New York City's finest designer shops, gourmet restaurants and all the major attractions of Manhattan.